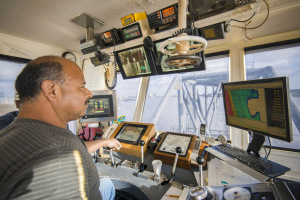 An Orion captain, contracted by the Port Authority, oversees the dredging at Barbours Cut. 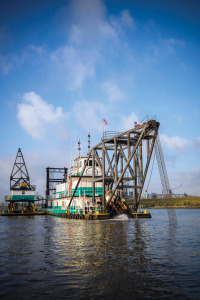 While Southeast Texas residents have been preoccupied celebrating the 100th anniversary of the Houston Ship Channel this year, Port of Houston (POH) authorities have placed their focus squarely on the future, with two massive dredging projects moving toward completion. The U.S. Army Corps of Engineers earlier this year permitted construction on the POH’s Bayport and Barbours Cut improvement project. Considered a single project, the work comes with a price tag between $130 and $150 million and, once completed, will widen and deepen the two critical waterways to allow for larger vessels to call on the ship channel and the POH. The work is being done in advance of the widening and expansion of the Panama Canal, scheduled for completion in the first quarter of 2016, that will allow the 100-year canal to handle larger vessels. POH Project Manager David Casebeer says the project includes work on the federally-controlled portions of both areas, as well as on POH berths and has been moving along on schedule. Dredging at the Barbours Cut channel. Dredging on the Barbours Cut channel began this summer and Casebeer says the dredge that had been working at Barbour’s Cut moved down to the Bayport Channel on Nov. 28 and is currently working in the open bay area of the channel near where the Bayport Channel and the Houston Ship Channel come together. “The work includes using the clay from the expanded portion of the federal channel to raise levees at Placement 15, which is in the Atkinson Island complex east of the ship channel,” Casebeer says. Located on the northern tip of Galveston Bay, adjacent to the Atkinson Island Wildlife Management Area, Barbours Cut is a 1.3-mile, 300-foot wide, 40-foot deep channel constructed in the 1970s. The project has increased the depth of the berthing area to 45 feet and has shifted the channel 75 feet to the north. To accomplish that task, dredging was done on the north side of the federal channel, in addition to deepening the berthing area by five feet. The improvements will also allow for larger cranes to service vessels at the docks. Situated near the southern end of Galveston Bay and right at the mouth of the Houston Ship Channel, the 3.5-mile long, 300-foot wide, 40-foot deep Bayport Channel was constructed between the mid-‘70s and mid-‘90s, and like the Barbours Cut Channel, advances in the size of ships utilizing the area have made widening and deepening the channel imperative to its future efficiency. It serves as the entrance to the Bayport Terminal, a high volume container terminal for the Port of Houston and one of the largest container terminals in the country. “At Bayport, we are deepening the depth to 45 feet, but we are not shifting the channel as we are at Barbours Cut. The project will widen the channel from 300 feet to 400 feet (in the federal portion) and once we’re inside the land, it will be widened to 350 feet,” Casebeer said. The work at both locations is being done by a cutter-suction dredge, which has blades on the front of an arm that can be lowered to reach the dredge material. The blades slice the material that is then removed via a vacuum intake, which then pumps the material to, in the case of the Barbour’s Cut project, bolster levees. Casebeer says the dredge is moving about 13,000 cubic yards of material every day. Casebeer says the dredge is operated by a crew of about 40 to 50 people, with another 10 to 15 people working land side on the levee building portion of the work. While dredging work takes place on a practically constant basis in one form or another along the 52-mile ship channel, these projects represent a critical stage in the life of the channel, one of the busiest waterways in the world. The widening of the Panama Canal, along with the addition of new locks, is having a ripple effect on the shipping industry. Once completed, the canal will be able to service larger Panamax-size ships, so ports around the world are working to ensure that they too can accommodate the larger vessels. Approved by the citizens of Panama in 2006, the $5.25-billion project calls for two new locks—one each at the Pacific and Atlantic sides—to be constructed. According to the Panama Canal Authority (PCA), the canal has been operating at near peak capacity for years now, with ships sometimes having to wait as long as seven days to pass through the canal during its busiest season, identified as December through March. The PCA estimates that the volume of cargo transiting the canal will grow by about three percent per year after the project is complete. Casebeer says crews are scheduled to complete the work at Barbours Cut in February 2015 and dredging work at both locations should be complete by September 2015, including all maintenance dredging at the federal portions. He says the projects have proceeded along as smoothly as officials could have imagined. “Every project assumes a certain amount of delay time, but we have stayed on track for all of our milestones and have not encountered any significant delays that would have caused us to revisit those milestones and make adjustments,” Casebeer said. Once completed, Casebeer says the ship channel will be ready to accommodate the larger ships immediately. He says, however, that the Houston Ship Channel Pilots Association is expected to institute a series of tests and evaluations prior to allowing standard shipping vessels to access the areas. Port officials say by increasing the berthing area depth at both channels, as well as widening the Bayport Channel and shifting the orientation of the Barbours Cut channel, the larger, more efficient ships will be able to gain access to the waterways, meaning that fewer ships would be needed to deliver cargo through the Houston Ship Channel. Generally speaking, these ships would also be newer vessels that use more fuel efficient engines, which would lessen the environmental impact of these ships as they traverse the channel.